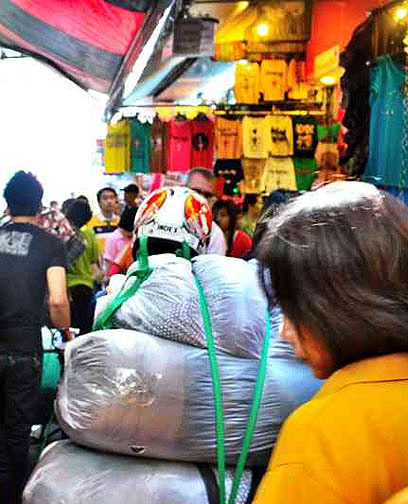 Pratunam Market offers pure chaos and some of the cheapest prices in Bangkok. Since I just mentioned the Pratunam wholesale shopping district in a recent post, I’d be remiss in not providing more details. And if you visited the Baiyoke Sky Tower and failed to spend some time shopping in the area, you’d be remiss in picking up some great deals. Though you will find the general feeling about Pratunam mixed from those who tied a shopping excursion in with their visit to Bangkok’s tallest building, with some amazed at the deals and others claiming the shopping is a rip-off, it really depends on how deeply into the district you wander. 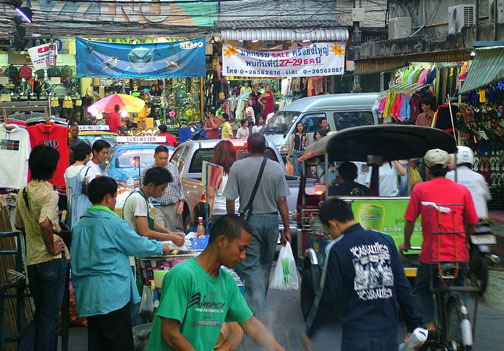 Most only hit the shops at Baiyoke or along the drive-through soi fronting the hotel. Owners of those stores know who they are dealing with: bus tourists. There is no need to offer unbelievable deals. Those people will buy anything. You won’t get the hot prices if you are not a fan of hot weather either. If you insist on shopping in air-conditioned comfort, there are better places for you to spend your money. Someone has to pay for all that cold air flowing out of the tiny stores’ doorways. And it isn’t going to be the store owner. So if you are looking for the bargains the district is famous for, wear comfortable shoes, grab a large bottle of water, and head back into the warren of small lanes that snake their way to god knows where. Make no mistake about it, there are great deals to be had at Pratunam. The hordes of locals packing the chaotic small lanes and 4,000 shops are proof of that. And since the majority of shops are manufacturers, you’ll not only find rock bottom prices but the elusive larger sizes that the American waistlines demands too. Part of finding those deals is knowing what is part of the Pratunam market and what is overflow shops cashing in on the market’s rep. But even in those you can find some decent deals, and some unique clothing too; many smaller designers have set up shop in the Pratunam area. 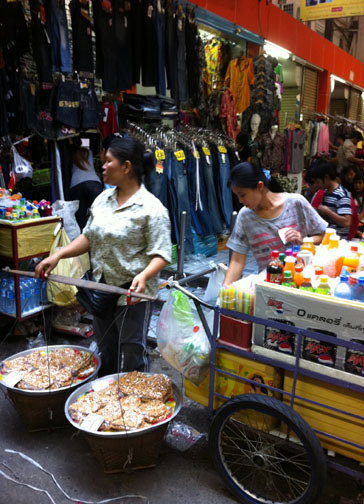 Hot and humid, the narrow lanes at Pratunam are crowded with shoppers. And motorcycles laden with fresh goods. Years ago Pratunam Market was easy to identify. It started at the intersection of Ratchaprarop and Phetchaburi Roads and was a sprawling dirty hot open air market packed with locals making a buck out of small store fronts that looked like closets. 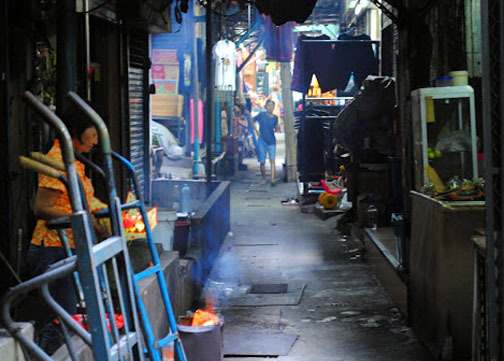 Today it is a bit cleaner, the street-side shops are more of a come-on, and the entire areas surrounding the market has become a shrine to consumerism. Some include the Platinum Fashion Mall, City Complex, Indra Square, and even Pantip Plaza in their definition of Pratunam. While those neighboring malls also all offer good prices (and deserve posts of their own), the real bargain hunters know they are not part of the market and are not where the best deals are to be had. Ditto for the shops that have sprung up in and around the Baiyoke Towers; for a shopaholic there is still a draw but you pay more for the easy access and slightly better atmosphere. Regardless of where you set the market’s borders, clothing is the name of the game. You’ll find a bit of electronics and lots of accessories too, but this is where Thailand’s wholesale garment trade began and the market is still true to its beginnings. There is tons of casual-wear available for the jeans and T-Shirts crowd, and formal evening wear and suits for the hi-so crowd too. The area closer to Phetchaburi Road has enough sequins, feathers, and beads to make any drag queen’s heart flutter, and both last year’s and next year’s fashion can be found, often in stores sitting side by side. Several shops along the perimeter of the market sell suitcases at cheap prices too – you’ll undoubtedly need one to pack home all the bargains you find. 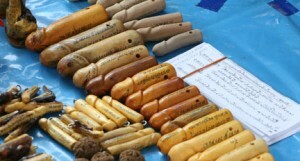 Pratunam is first and foremost a wholesale market. So you’ll get your best deal when buying in quantities. Fortunately, three seems to be the quantity you need to hit to get the best price. Though if you are thinking of importing some goods, most of the shops are manufacturers and you can get even better prices when ordering by the gross. But that is not a decision to enter into lightly. You need to be familiar with your home country’s rules on importing clothing. 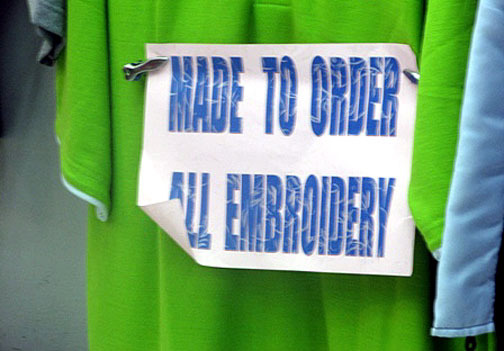 And cheap prices can also mean cheap goods – bad stitching and generally poor workmanship translates into bucks for the shop owner, so beware! Pratunam is a wholesale market and is open 24 hours. But most shops are not. Some shops are manufacturers, others sell seconds from known manufacturers, and a lot more are busy selling knock-offs. If fakes don’t bother you go for it. If they do, note that Gucci is spelled with two c’s, not three. An odd paradox is that not may shops have a dressing room for you to try clothing on, but most have a seamstress manning a sewing machine from the 1950s, ready to make alterations for a song. If you are not an expert at eyeballing sizes, be persistent about the need of trying on what you are thinking of buying. Eventually the vendor will give in and lead you to a neighboring shop that has a tiny dressing room. Or they’ll push you to the back of a counter and assume that’s all the privacy you need. Do not assume the sizes sewn into the label are accurate. In fact, it’s safer to assume they are not. You can also assume if you need anything larger than an XL in casual clothing you’ll pay more for it. And if you normally wear an XL, you’ll probably need an XXL in Thailand. The vendors’ profit margins are low at Pratunam and they’ll want you to cover the extra cost of the material they used to produce your big guy size. And it goes without saying, though I will say it anyway, that cash is king. You won’t get a discount for paying in cash, but will pay 3-5% for using a credit card. If it is accepted at all. You’d think at a street market in Bangkok haggling skills would be required. And they are at most markets that are frequented by touri. At Pratunam, not so much. Many shops have signs displaying their price. At those that do, consider it a fixed price unless you are buying in quantities (though it never hurts to try to get a better deal). At those where you have to ask the price, don’t expect the vendor to come down much from his initial price. You’ll find you are haggling over twenty baht at best. 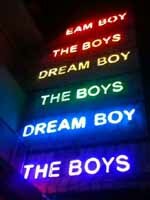 And guess where all the ladyboys shop! So how good of a deal can you get at Pratunam? Playing follow the price tag is a good way to find out. There is a popular Japanese T-shirt brand called Sure that is manufactured in Thailand. The short sleeved Asian sizes run $30-40 in Japan. In boutiques at Central World, just up the street from Pratunam, they go for the equivalent of $20. Over on Khoasan Road if you bargain hard you can get one for $15. At MBK the price drops to $12, and at Platinum Fashion Mall you can pick one up for $10. The manufacturer has an outlet on Phetchaburi Road on the perimeter of Pratunam market where even when buying a single shirt you can still get one as low as $6. But if you wander back into the market to their main shop they are only $5. Catch them inside the market when they are clearing their seconds out, which have minor and often unnoticeable blemishes, and you can snag one for $3. I picked a gross of them up at wholesale prices and blew them out within a month at $25 each back in the states. Which paid for my air fare and hotel for the entire trip. Local shop owners do the same without the air fare involved. You’ll see them loaded down with bundles, scurrying across the street or filling a taxi to take their purchases across the street to Platinum or to MBK where they’ll be glad to sell you what they bought at Pratunam that morning for twice the price. Pratunam is where you can cut the middle man out while being kind to your wallet. Technically, the market runs twenty-four hours. Realistically, your shopping will be between 10:00 am and 6:00 pm. Though keep in mind you are in Thailand. Some shops won’t be opened by 10:00 am and many will have closed by 4:00 pm. The air-conditioned stores around the market’s perimeter stay open later, until 9:00 pm, and there is a decent night market that sprawls out and across Ratchaprarop Road that can run into the early morning hours depending on the weather, the crowds, and the mood of the vendors. No worries if you get hungry while shopping at Pratunam, the food comes to you. Getting to Pratunam is half the fun. At least it is if you consider a root canal an enjoyable experience. Bangkok’s horrendous traffic reaches its peak just where you want to go. And you’ll have a difficult time finding a taxi willing to take you there. The BTS is an option, though all of the closest stations are still several long blocks away. And the MTR isn’t much better. The walk from any station isn’t insurmountable, but since you’ll be spending several hours walking through Bangkok’s infamous heat and humidity while shopping, tacking an extra fifteen to twenty minute walk on to the front of your journey isn’t a wise move. Many websites suggest taking the BTS to Ratchathewi Station and catching a tuk tuk or taxi from there. Good luck with that. Ratchadamri Road, in front of Central World, looks like a parking lot for much of the day and the traffic moves even slower than in a parking lot. If you can not find a taxi willing to take you into the area, your best bet is to take the BTS to the Chidlom Station, use the elevated walkway to Central World Mall, stroll down Ratchadamri Road in air-conditioned comfort, and then make a mad dash across Phetchaburi Road to the market. Or if you are a true shopaholic, stay at one of the hotels in the immediate area. Getting out is a bit easier. Unless you were able to resist all of the great bargains, you’ll be loaded down with packages and bags, so take a taxi. 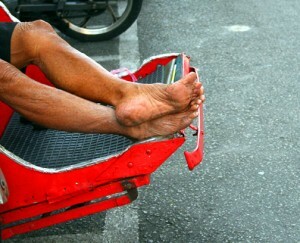 You can usually find one around the Baiyoke Sky Tower, but don’t be surprised if available drivers demand a fixed fare. It’s the only place in town where I don’t argue about not using the meter. That the poor drivers have to brave the surrounding traffic elicits pity from even the cheapest or most hardened heart. Besides, with all the money you just saved shopping at Pratunam Market you can afford it. Made to order, custom made, or for quick alterations, Pratunam can’t be beat. And they’ll do a much better job than any rip-off Indian tailor in town. You can go there by canal boat or by bus (in a traffic jam, a bus is as fast as a taxi, but much cheaper – but usually without aircon). I wonder about the fixed fare. The meter runs by kilometers when driving or minutes when standing or driving slower than (I forgot how many km/h). So traffic jams are already metered in. True Christian, but for Bangkok taxi drivers that is much too technical. They’ll always go with the fixed fare even when it means short changing themselves. Thanks for all that great info! helped me a lot. Im currently trying to find accommodation close to Pratunam Market/ platinum mall. Would you reccommend Baiyoke would be good? any advise would be so helpful! 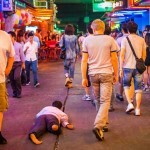 Baiyoke is smack dab in the middle of Pratunam, so it would be a good choice. At least location-wise. You may want to read some reviews – Agoda is a good site for honest opinions. After the weekend I’ll do a post with a bit more info (your comment inspired me!) so you may want to check back for a fuller answer along with some other options to consider. What time the market start business? i heard is early morning 5.30am, is it? Yes, technically with the break of dawn. But most shops don’t open until around 9 or 10. Within a five minute walk – assuming you are wearing blinders so as to not get caught up shopping along the way – there are hotels for every budget. 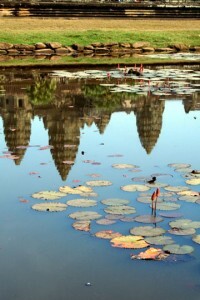 I may not get around to it until next week, but will post an article about the hotel choices around Pratunam. When I do I’ll add a link to it in this comment section so it will be easily for you to find Cindel. Thanks for your review, it is very helpful. I am about to visit Bangkok on my first business trip. I intend to make a few pounds out of wholesale clothing back in the UK. Let say that I d like to buy a dress that is costing 150 baht. How low can the price get per item if I buy more than three and up to 80 (different sizes, color)? Can they make to order a 80 dresses within a few days? As I would like to check each dress for default? And I will be staying only the week. Do they had tags? And your brand name? Do they ship stuf back for you? How much does it cost? And if you buy something from one manufacturer at the beginning of the trip can he keep it until you have enough from other manufacturer to load a UPS or FedEx box? Um, you do know I charge $200 an hour for consulting fees, right? I’m usually a fairly positive kind of guy. But by the time I was done reading your comment the glass was totally empty. Even though the short answer to all of your non-price related questions is yes. So let me start with noting that you are probably familiar with the acronym KISS. And no where does that apply as aptly as it does in Thailand. But let me address the easy part first. A garment that sells at 150 baht ‘retail’ at Pratunam will run between 100 and 125 baht when you buy 3. For a large quantity order you may get it as low as 80 baht; but it will depend on the merchant and how much profit they have in it at the three price – there’s not a lot of room to maneuver when your original price is under five bucks. On the plus side, you will not have to haggle to get the first discount, and probably won’t for the bottom price based on quantity other than asking how much. The wholesale vendors already are pricing their merchandise to move and it is not a game about seeing how much they can get out of you like at a street market. And to be honest with you, you are talking about a $250 purchase . . . don’t expect the red carpet to be rolled out for that size of an order. As for the remainder of your questions, this is Thailand so the answer is always yes. Yes, they can make to order 80 dresses within a few days – but speed just became the operative issue and quality may suffer. Best to ask first how long that order would take and then if not quick enough you’ll have to consider the issues a rush order will entail. Yes, if made to order you can and should check each piece for defects. But with only a few days available to you, what will you do if a lot of the order is substandard? You will have to pay a large deposit when you place the order. And Thais are not big on giving refunds. Yes, most have their own tags as well as any required by law for the countries they regularly deal with (for example in the U.S. a tag stating the country of origin is required). Custom tags you’ll probably have to have made at a different shop, or the place you are buying from may know of one or works with one – but you just added time to your production schedule. And if the tags are not right and have already been sewn to the garment . . . Yes, they will ship. Do you know exactly what forms and paperwork are required to import clothing into your country? They may not and its doubtful they’ll go out of their way to insure all necessary paperwork is completed. But that depends on the size of the shop and the amount of exporting they do. Most will not charge you a fee above the actual shipping costs, but you’ll have to specify how your order will be shipped and via what company . . . are you planning on going air? Sea? Expedited? Regular mail? There is a large difference in cost, delivery time, and potential for loss and/or damage. It sounds from these last two questions you are considering placing the order and then having it shipped to you once it has been made ready. Here’s the problem with that when you are ordering custom made. Thais aim to please. Unfortunately, often their aim is off. What they will focus on is that you want 80 dresses. That you wanted them in navy blue and the best they could come up with was red . . . that’s what you’ll get. Now what will you do? If you walk into a shoe store in Bangkok, find the pair you love, and ask for a size 10 – if they do not have that size and you are lucky the clerk will say, “Sorry, finnit.” More likely he will bring out a size 8. And then be stumped when you are not happy with that. Seriously. Give it a try, and you’ll see what I mean. Expect the same with your custom order of clothing. The color, sizes, design, material . . . it’s all minor details. BTW, you also need to realize sizes in Thailand are probably smaller than in your home country. I always order “American Size” which most vendors know means twice the size of what they were gonna make. Of course the gods may favor you and everything will go perfectly for you too. But that doesn’t take planning. Dealing with problems – many of which you probably never thought of – as they come up will be the taxing part of what you propose. Especially as a first timer. If this is a one-off proposition, good luck and keep your fingers crossed. If you are considering this as a steady income flow, I’d suggest buying pre-made your first time out, learn from that experience, and then move into custom made once you know the ropes and potential pitfalls. Thank you so much for your comment! By the time I finished reading it I had arrived at the same conclusion that you did. Custom made is not a wise choice for me that is only just starting the business. Good, I think that’ll be a lot less hectic for you this time around. Good luck with your business! Yes, Maria it is. Because ‘Pratunam Morning Market’ is a misnomer. There is no morning market. The main soi that leads to/from Baiyoke gets going earlier than the small shops deeper within the market, but it is all the same. ‘Pratunam Morning Market’ is a name tourists who get up early came up with. Amazingly, they even quote official opening and closing hours. But it is the same market. There is, however, a night market that is often called Pratunam – it is across the street but it is not a wholesale/retail clothing market, it’s more typical of most street markets in Bangkok. Hope that helps! Uh, no Maria, same answer as earlier. They are the exact same place, with the exact same vendors, offering the exact same prices. Except more stalls open after 9 – 10-ish further into the market. There is no Pratunam Morning Market, it is the Pratunam Market, just some people go early. Thanks Fatz and thanks for taking the time to comment. Hope your wholesale shopping excursion is a success! Yes, this blog is awesome, I am wondering how you got the Sure shirts back to U.S.? I am going for a month in Thailand in June and am really interested in buying some stuff and bringing it back to sell – on line (I build web sites) or at markets (or both) here in Hawaii. I recently bought a Sure shirt (which I love for $29) – so the margin is excellent…would love to pay for my trip like you did. Can you give me info on how I get the goods back to the U.S.? I’m thinking SURE shirts, other clothing items, jewelry and possibly some home decor items. Oh, Jennifer . . . Your comment and questions, which I thank you for, came in at a fortuitous time since I was just thinking of writing a related post. Today’s article, How To Not Succeed At Business Without Really Trying, I think answers most of your questions. Though after reading it you may have a different opinion on just how fortunate you are for that info. I hope the article helps and doesn’t dissuade you from your plan. If you have any other questions, feel free to drop a note. If you still dare. Hi Jennifer, I am in Bangkok right now and just visited chatachuk market today, they had 2 shipping stalls that I could see, one was DHL and they were charging 239 baht per kilo to USA, this is approximately $8 per kilo, not sure if that’s very cheap, but the clothing is very cheap and not too heavy I’m thinking so may be a good option. Love your blog, very informative, I’m heading to pratunum markets first thing tomorrow, hope to get a formal dress made and grab a few bargains. Hope you have fun at Pratunam tomorrow. A foot massage when you’re done is a grand idea. Yes, Cheryl, you can find the type of textiles you are speaking of in Bangkok, and a tailor knowledgeable about working with those types of fabrics too. But Pratunam may not be your best answer (and Platinum Fashion Mall is gonna be even worse). Nonetheless I’d start at Pratunam anyway. Go around 10ish, before it gets too hot and after all the shops and stalls have opened, and then head into the small warren of sois – you are not going to find those dealing in speciality clothing on the main drags. You may or may not find what you are looking for specifically, but at a minimum it’ll give you an idea of what is available and may even provide some design ideas you’ll want to steal. The thing with Pratunam is most vendors sell a ready-made product which they may or may not be willing to customize for you. They are not really set up to produce something entirely different. 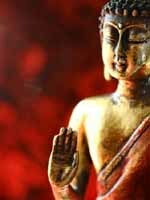 Although since Thais have a natural affinity against saying no, many will agree to what you want anyway. So take care. You’ll do much better in Little India, and at the India Emporium Mall specifically. There you will find a large selection of textile stores selling fabrics for use by the local Hindu population from simple cotton cloth to ornate textiles filled with sequins and beads. Which sounds like just what you are looking for. And with what you are planning, starting with the fabrics first is probably the way to go. If the shop you find your material at is not set up to produce finished product, undoubtedly they will have a recommendation of a tailor who will. And that shop will have the necessary experience in dealing with specialty fabrics. Personally, I’d ask the place I’m buying the fabric from for a few recommendations and then interview each – on-site – to get a feel for which is most likely to produce quality workmanship at a reasonable price. What I would not do is try to find a tailor on my own. There are a million Indian tailor shops in Bangkok, all of which tout the long list of industry awards they’ve won. Most of which they won by giving themselves an award. Their MO is a quick turnaround at cheap prices. And you get exactly what you pay for. I offer that bit of wisdom just in case you end up thinking any Indian tailor will be capable of producing what you are interested in having made. Which they will, but the clothing may not survive the first bout of turbulence your plane experiences on the way home. Not that I can recall Nicole. You’d probably do better at MBK. Thank you so much for this great info! I’m sitting in my hotel room in BKK now planning how best to scratch my shopping itch on my last day tomorrow. Pratanum it is! Hope you have someone to carry you to the plane! Though I have been to Thailand a lot of times… I feel I have never been there after having read your amazing blogs. And the comments too! I’m blown away. Well – I’m a drag queen in Europe… and though I am only in Bangkok 5 days this time – I would love to have some new dresses sown – and perhaps buy a couple of nice wigs. I’m.. well… ehm… a pretty big guy – hence it needs to be custom made. Where would you recommend me to go to have this done? Little India – or Pratunam (and yes – I read you have a 200$ consultant fee)? I was actually thinking of perhaps offing a ladyboy or bar boy and have her/him show me a good place to buy these things… however, I am not sure they will be helpful (I read your guide to doing that too). Pratunam for sure. There are a few shops favored by drag queens there. Kinda buried away but if you make a few fabulous gestures when asking directions I’m sure you’ll find them. Better yet, check with some of the local girls or offer to take one on a shopping spree. Not sure about Little India, you will adore the material available but I’m not sure about getting gowns made. 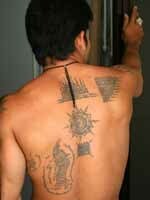 Then again India has its own version of ladyboy, so who knows. The problem is a greedy tailor will always say he can make what you want, but few have experience with women’s clothing. Pick out a design with buttons and ask where they would be placed – if he indicates the same side that men’s buttons appear on you know you got a dud (good tip learned from a pair of dykes friends). BTW, you know it’s rude to brag about being pretty big. Especially around Asians. I’ll try to find someone on gayromeo before I arrive. If you – or the other readers – should know of someone qualified and willing to join me… please ping me! On a totally different note – do you know if Nature Boy is still operating? I have laughed so heartly reading yours and others reviews on the place – and I just have to see it! I have actually decided to spend an entire night gogo-bar surfing (and I honestly would never have believed I should do so!) based on your advice. And looking forward to giving you my feedback. BTW – could see you were considering India. I love India – and am there at least once every year. In all honesty – you really ought to try a train ride down there. Of course not third class – but a night trip from e.g. Bangalore to Hospit (and then get a private driver from there 😉 ). The scenery during a moonlight night is to die for! The same goes for experiencing some of the crowded places by night. They change into a society of its own. Hard to explain. An example though. Marina Beach in Chennai – by day so full of life and luxury – by night it is home to more than 50.000 people sleeping in small groups… taking turn guarding there spot and their (few) belongings. I watched it behind toned windows in a limo from a safe distance… but I cried my heart out when I saw a child sitting with a rifle guarding his family. An eye opener. 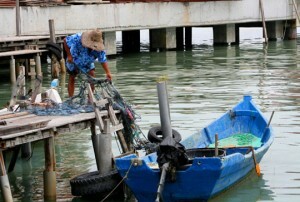 I have seen some of the same things in Indonesia and Northern Thailand too… but never to that extent. Oh – and in Delhi… please visit New Friends Colony (yes – it is a ghetto I know). I had the best meal of my life there (and there a lot of 4* and 5* hotels close by whom will have a bodyguard escorting you! Once again: thank you so much for your kind help and enchanting blog! Thanks for the India tips Richard. And yes, Nature Boy is still open. As are all their bar boys’ legs. Your blog was great to read and I have found so much useful info so thanks for that! I wonder if you could offer me some advice. I’m hoping to get my bridesmaid’s dresses made in Bangkok. My mom is going over there next month so I am assigning her with the task of finding a decent dress maker to make them for me. Do you have any suggestions on who are reputable and reliable dressmakers? We will have everyone’s measurements professionally taken here at home (my mom is a seamstress so she should be able to explain to them what the measurements are). Or do you think this is asking for trouble? I look forward to hearing from you and thanks in advance. Um, you may be asking for more trouble than the savings are worth. My biggest concern would be no one will be there to try the finished garmets on. Maybe since moms is a seamstress that can be handled back home though. On the plus side, mom probably has a good eye and can inspect for quality before accepting the finished product. I’d start at Pratunam and look for a stall with similar gowns on display. If an agreement can be made on material etc, do not leave more than 25% as a deposit – the remaining agreed to price may be needed to use as a bartering chip if what is delivered doesn’t measure up. You didn’t mention how long moms will be in Bangkok. I wouldn’t undertake this project with anything less than a full week to sew everything up. Im planning on a trip to bangkok to look for suppliers? Any tips? Thanks.